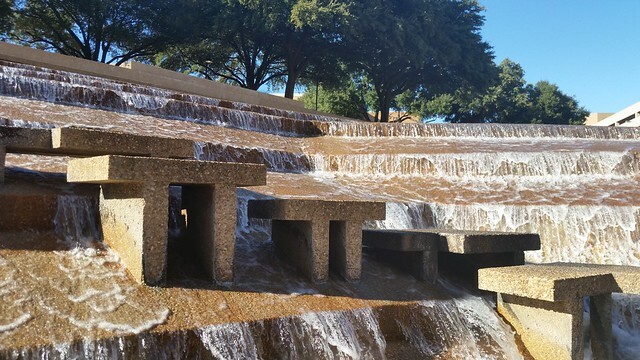 After lunch on Friday at SMOFCon 33, Lisa and I walked across the street to the Fort Worth Water Gardens. This is an SFnal site, having been seen as part of the movie Logan's Run. 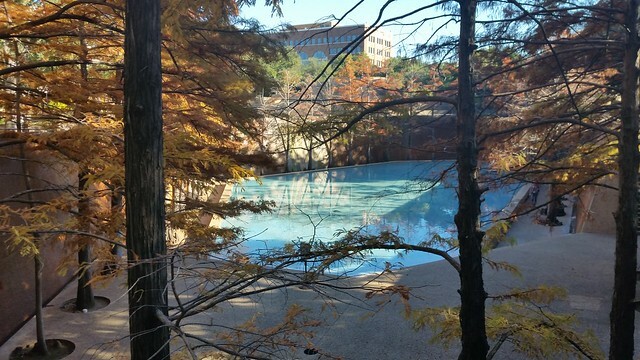 The Water Gardens have multiple water features: this one is the Active Pool, a huge fountain. 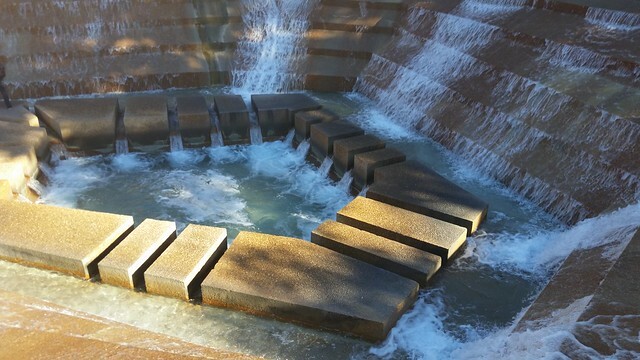 Unlike most fountains, this one encourages you getting into the action: there are stairs that lead down into the middle of the fountain. Lisa and I carefully descended the stairs. Lisa loved it. She was able to take her tinnitus-blocking static earplug out and stand in the roar of the fountain in peace. I'll post a video I shot from inside the fountain when I get the chance. 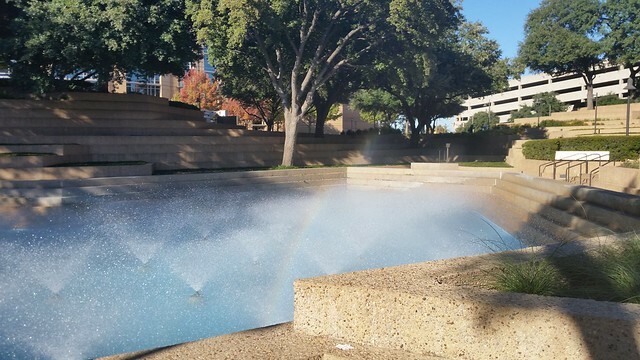 The Aerated Pool throws a mist into the air, and in this case a rainbow was visible within it. The Quiet Pool is something of the opposite of the Active Pool: a quiet oasis suitable for contemplation among the trees. I really enjoyed the Water Garden. It's a fascinating place. Click through any of the photos to see more photos from around the Garden. Lisa took a nap this afternoon when I went to afternoon programming. pcornelius is not attending SMOFCon, but came down to visit Lisa. After programming, he took the three of us to Cattlemen's Fort Worth Steakhouse, where we all had excellent dinners and conversation. Lisa and Chris plan to go out on Saturday and visit a railroad museum while I'm involved in SMOFCon. Saturday night is the Fannish Inquisition (Lisa is recording it; I'll be uploading it) followed by the Probability & Statistics Seminar.